Last month, the BHHC had the pleasure to receive a guided tour of the University of Maryland’s special collections at Hornbake Library. Archivist Beth Alvarez started off with a tour of the Katherine Anne Porter room. A Porter enthusiast, Ms. Alvarez happily shared her extensive knowledge of the author’s eventful live. Ms. Porter (1890-1980) is best known for her novel “Ship of Fools” and lived in many places, including Europe and Mexico. But in her last years she occupied an apartment in Westchester Park, just across the street from Berwyn Heights. Next, Doug McElrath, Curator of Marylandia and Rare Books at Hornbake Library, gave our group a tour of the Maryland Room. 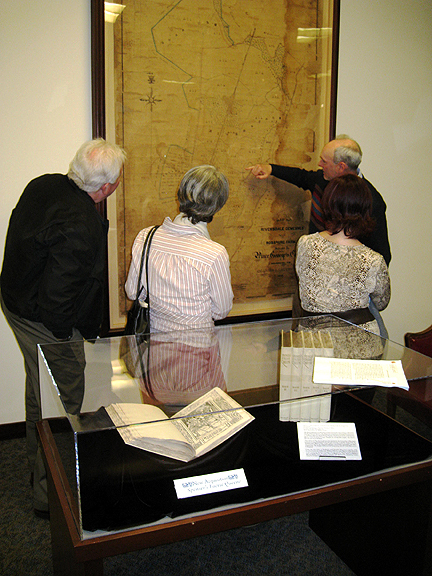 He had pulled out a number of documents and maps relating to Berwyn Heights’ history, and gave us an overview of the resources available at the library. This triggered a lively exchange about the research interests of the BHHC and Mr. McElrath, who happens to be a member of the Riverdale Historical Society. The visit ended with BHHC members resolved to come back for more research and with a preliminary agreement to transfer some records to the Maryland Room archive.